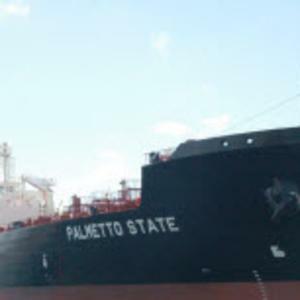 BROWARD COUNTY, FL - Broward County&apos;s Port Everglades today welcomed the newly built Palmetto State, a 50,000-ton petroleum tanker that is being chartered by Citgo. The ship arrived with 276,000 barrels, or 11,592,000 gallons, of gasoline and jet fuel. "While we have nearly 600 petroleum tanker and barge calls annually, it is a rare opportunity for us to welcome a brand new petroleum tanker to our seaport," said Port Everglades Deputy Director Glenn Wiltshire. "The Palmetto State is state-of-the-art among American-made and American-flagged tankers, with excellent fuel efficiency and advanced technology." The Palmetto State is 610-feet long with a 106-foot beam. It is an LNG-conversion-ready product tanker with a 330,000 barrel cargo capacity owned by American Petroleum Tankers (APT) and operated by Crowley Maritime Corporation. General Dynamics NASSCO constructed the tanker in San Diego, CA, as part of an eight-ship contract. NASSCO states that the each of the tankers offer 33 percent increased fuel efficiency and cleaner shipping options. Port Everglades is South Florida&apos;s main seaport for receiving petroleum products including gasoline, jet fuel and alternative fuels. The current level of annual petroleum production for the region is more than 121 million barrels in FY2016, an increase of 3.6 percent from FY2015. The Port Everglades Department is a self-supporting Enterprise Fund of Broward County, Florida government with operating revenues of almost $163 million in Fiscal Year 2016 (October 1, 2015 through September 30, 2016). It does not rely on local tax dollars for operations. The total value of economic activity related to Port Everglades is nearly $30 billion. More than 222,000 Florida jobs are impacted by the Port, including almost 13,000 people who work for companies that provide direct services to Port Everglades. For more information on Port Everglades, go to porteverglades.net or e-mail PortEverglades@broward.org.